JAMAL MOHAMED COLLEGE established in the year 1951 at Tiruchirappalli, the heart of Tamil Nadu, stands as a living testimony to the vision of its founding fathers, Janab Haji M. Jamal Mohamed Sahib and Janab N. M. Khajamian Rowther, leading business magnates and philanthropists of fame. The college, today, has emerged as one of the premier institutions of South India, offering 14 UG and 19 PG courses and 13 Research programmes leading to M.Phil and Ph.D degree, with a strength of 5000 students including 1300 women students. The college is now offering a number of diversified, inter-disciplinary courses in the emerging areas like Computer Science and Computer Applications, Microbiology, Biotechnology, Environment Science and thereby caters to the growing needs of the modern industrial India. Various departments in the College are housed in separate buildings with excellent infrastructural facilities like computer lab, internet facilities, well-stacked library, spacious seminar halls with audio/video facilities, reading rooms and non-resident student center. The college is blessed with totally dedicated and committed members of 222 teaching and 159 non-teaching staff, who always strive for excellence, taking the youth of today to mould them into better citizens of tomorrow. The college has been accredited with FIVE STAR status by National Assessment and Accreditation Council (NAAC) during the year 2001. 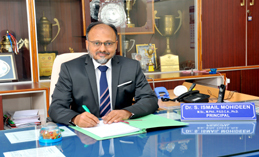 The College has been granted Autonomous Status by the UGC and Bharathidasan University from the academic year 2004-2005 and Choice Based Credit System (CBCS) is introduced for UG and PG programmes. To become a world class, highly acclaimed, innovative, competitive and most successful Higher Education Institution in the status of a Deemed University by offering many value added and socially relevant courses to serve all sections of the society including Minority, Backward and Disadvantaged students. Imparting training in productive services. The Department of Computer Science was established in the year 1986 with the introduction of B.Sc. Computer Science course with an initial intake of 50 students. The department has since been on its road to growth in phased manner and now offers course like B.Sc. (CS) (4 Sections), BCA (4 Sections), MCA (2 Sections), M.Sc. (CS) (2 Sections), M.Sc. (IT) (2 Sections), M.Phil., PGDCA, PGDCH and Career Oriented Programme in Computer Hardware and Network Administration. The student strength has increased to 1425 including 385 women. The Department is equipped with well-furnished and air-conditioned laboratories with latest configuration computer systems, spacious class rooms and air-conditioned seminal hall. The department is providing conductive learning atmosphere to the students to make use of the facilities available in the campus and improve their knowledge and inter-personal skills for meeting the challenges in this millennium. The excellent infrastructure facilities available in the department and the quality IT education offered have been well appreciated by researchers and academicians. The department of computer science offers the prestigious MCA programme, under grant-in-aid from the Govt. of Tamil Nadu and affiliated to Bharathidasan University, from the year 1988. Another batch of MCA programme, under self-finance scheme, was started in the year 1992. Both the batches are approved by the AICTE. The department has been consistently producing 100% results. MCA Programme in Jamal Mohamed College was started as early in 1988 with a vision of grooming computer professionals by providing quality education in computer applications in order to cater to the requirements of IT industry and IT enabled services. There has been an increasing demand for professionally trained and competent computer professionals not only in India but also in other parts of the globe. Our college provides an opportunity for the aspiring youth to get trained and placed in the industry. I am happy to inform that the MCA Programme offered by our college is AICTE approved and has carved a niche in providing state-of-the-art facilities, quality education and training and excellent placement record in leading national and multi-national companies. Hundreds of our students have been well placed as computer executives not only in India but also in countries like USA, Canada, UK, UAE, Saudi Arabia, Kuwait, Bahrain, Malaysia and Singapore. Autonomy has enabled the College to design the curriculum under Choice Based Credit System to suit the changing requirements of the IT industry and IT enabled services. Students are given excellent field exposure in software by dedicated team of well trained and experienced faculty members. Our college strives for excellence in providing quality education and training our students to get placed in covetable positions. I wish all the best to the faculty and the students for achieving excellence.